Grit is the ability to work through negative emotions to reach your goal. Research by Angela Lee Duckworth, Carol Dweck, Paul Tough, and others demonstrates that students with grit are happier and more productive. At Rising Stars Foundation, our mission is to build and measure grit for students and job seekers. Applicants take the Gritter Test at their own pace. Four 15-minute sessions over 2-5 days are sufficient; more is OK, too. It’s open book; applicants may use any resource they desire. The test has no pre-requisites other than Internet access and a computer, smartphone, or tablet. The only instructions an applicant needs is a logon and URL. 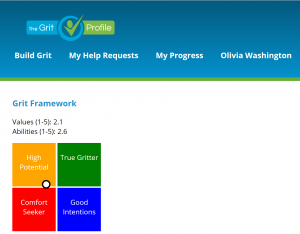 In addition to the three metrics, the Gritter Profile provides drill-down analysis and synthesis for richness.